Amadeo Modigliani, The Jewess (1908). Cold, yet elegant. Commanding, yet elusive. 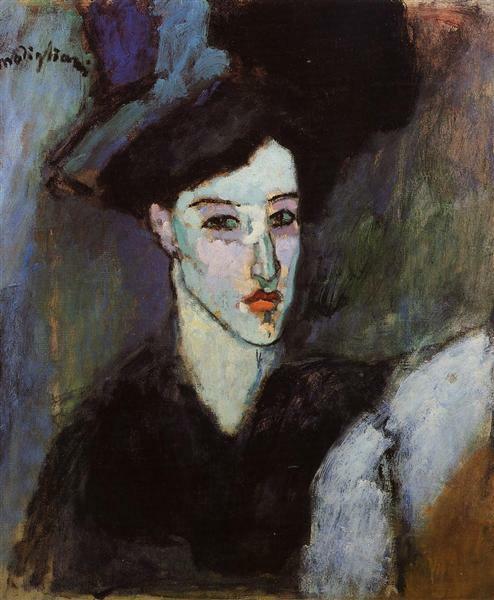 Modigliani’s 1908 portrait The Jewess greets viewers with an impenetrable gaze. Placed at the entrance of Modigliani Unmasked, a temporary exhibition at The Jewish Museum, The Jewess confronts visitors as soon as they enter. Though she turns her head slightly, her eyes match her viewers’ stare as she purses her lips. The unnaturally white pallor of her skin stands in contrast to the cool blues and purples of the work’s background. Her highly contoured facial features jut out of the painting, disconnecting her from her surrounding environment. Nothing overtly marks The Jewess as Jewish. Yet, with an unblended stroke of white paint between the bridge of her nose and her forehead, Modigliani draws his viewers’ attention to the woman’s curved nose. Besides for the invocation of this stereotypically “Jewish” nose, she displays no signs of “Jewishness.” So, why this particular title? There is a symbolic significance to the placement of The Jewess at the beginning of the exhibition. The Jewess immediately establishes Modigliani’s grappling with his own Jewish identity and demonstrates his interest in unpacking identity as a construct more generally. The Paris in which Modigliani settled in 1906, however, had just been shaken by the Dreyfus Affair. Widespread French anti-Semitism spurred an intense artistic interest in physiognomy—the idea that facial features could reveal something about a person’s character. As a result, Modigliani became acutely aware of his otherness, as a Jew. Given Modigliani’s upbringing and the apparent strength of his Jewish identity, it is perhaps surprising that he titled this work The Jewess—a title that strips his subject of her individuality. He reduces her to her ethnic orientation, as if nothing else about her matters. And not only does he label her as Jewish, but he titles her “the Jewess,” a name which rolls of the tongue with a hiss, connoting something menacing. On the other hand, Modigliani’s title might serve as an attempt to subvert expectations of what a Jew looks like. Rather than portraying The Jewess as a caricature, he presents her as a mysterious and striking woman. Through his art, he demonstrates that despite her title, and the stereotypes through which others see Jews, she is actually a complex individual. By redefining typical Jewish stereotypes, Modigliani may have been striving to change perceptions of Jewish society, as a whole. Can we then hail Modigliani as a courageous advocate for Jews? While Modigliani certainly did not shy away from his Jewish status, most of his subsequent art was not focused on Jewish themes. As Modigliani’s later work in the exhibition reveals, the artist quickly strayed from his exploration of Jewish identity and moved toward representation of the human form in a more universal manner. Rather than emphasizing his subjects’ uniqueness and imperfections, he depicted them as impersonal and mask-like: with long necks, oblong faces, and almond eyes that contain no color. Readily mixing Western and non-Western influences, he rids his works of identity-based distinctions, suggesting instead that there is something common that binds together all people. Perhaps Modigliani consciously chose this universalizing style in order to refrain from perpetuating anti-Semitic stereotypes; yet in doing so, Modigliani abandons his project, whether intentional or not, of advocating against Jewish stereotypes. Though he continues to crusade against the confines of identification, he is no longer demonstrating the uniqueness of being Jewish. And this method does not do anything to change the negative perceptions of Jews that plagued his milieu. The Jewess, therefore, marks the beginning and the end of Modigliani as a quasi-Jewish advocate. In creating this work, Modigliani demonstrated his proud acceptance of his Jewish roots and made clear that he was unafraid to take on such a controversial subject. Ultimately, by presenting this woman as elegant and sophisticated, he showed that she was no different from any other French woman. Unfortunately, Modigliani’s life was cut short by his premature death in 1920 at the age of 35. It would have been interesting to see how he might have artistically handled the institutionalized anti-Semitism of the Third Reich. Would Modigliani have emigrated to America, as Chagall did, and continued his artistic exploration of Jewishness? Might he have painted other Jewesses—proud and defiant? Would he have continued universalizing the human face in an effort to eradicate differentness and cultural particularism? Or worse, would he have stopped painting Jewish subjects entirely? We will never know, and The Jewess’ impenetrable gaze does not guide us. Instead she stares, hinting at the possibility of change, yet with a knowing acceptance of her fate. //Dani Lefkowitz is a junior in Barnard College and Deputy Literary and Arts Editor of The Current. She can be reached at dsl2152@barnard.edu.